We have gotten into a routine of sleeping late in the morning, having an afternoon activity and then returning home for dinner. Everyone is on a similar sleep schedule, which makes this much easier! Today we left the apartment late in the morning and took the metro to Pont de l’Alma to ride the Bateaux-Mouches up and down the Seine. Several photos are here: https://gallery.dromomania.net/Travel/2018/Paris-2018. Then we took the metro to the Latin Quarter and split into two groups for lunch. The Gabbys ate at a seafood restaurant while the Butsons had gyros for lunch. 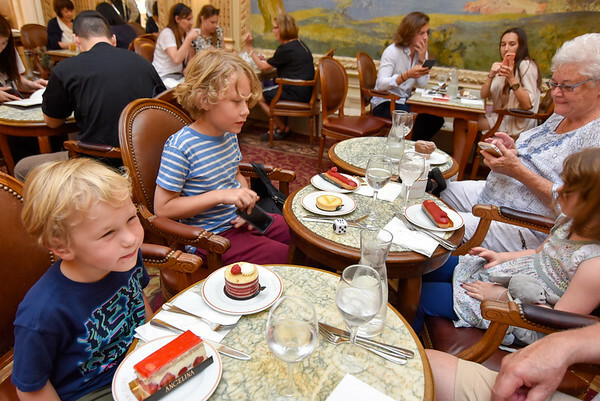 We walked from the Latin Quarter past Notre Dame and made our way to Angelina’s for an afternoon treat which turned out to be dessert dinner: each of the kids ordered hot chocolate (this is seriously the best hot chocolate in the world) and two desserts. Amazing!